Alumni Göttingen connects more than 30,000 alumni with those people who study, research and work at the University of Göttingen today. Whether you want to keep in touch with old friends and acquaintances from your student days or contribute your talents, ideas or resources - every kind of commitment makes our network livelier! The Göttingen Alumni Day 2019 will take place on 26 October 2019. All alumni and friends of the Alumni Network are cordially invited to participate. Make valuable contacts at alumni events in Göttingen, in many major German cities, in Asia and the USA, but also online via the Alumni Portal and in other social networks. 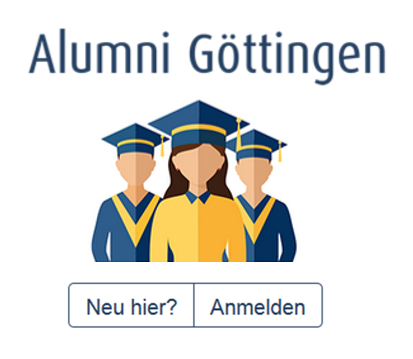 The aim of the Alumni Portal is to network as many people as possible who are associated with the University of Göttingen and Alumni Göttingen. The online offering is not only intended for members of Alumni Göttingen e.V. but is also open to all alumni and graduates as well as students and other members of the University of Göttingen. Registration in the Alumni Network is free of charge. Our alumni groups on XING and LinkedIn and our Facebook page offer additional ways of getting in touch and communicating with each other to all alumni, students and employees. You can find alumni of the University of Göttingen all over the world. Would you like to make alumni contacts in your city or in a specific region? Then join our regional group or establish your own! There are also interest groups on specific topics or hobbies in our alumni network. Find like-minded people! alumni4students alumni4students is a series of events with practical talks and workshops for professional orientation given by alumni for students. The alumni provide exciting insights into everyday professional life and careers and give valuable suggestions for career orientation, application and networking. This series of events usually takes place as part of the supporting programme of the career fair PRAXISBÖRSE of the University of Göttingen. Lassen Sie Berufsanfänger*innen und junge Gründer*innen an Ihrem Wissen teilhaben. Gemeinsam mit engagierten Partnern aus der Wirtschaft möchten wir das Unterstützungsnetzwerk zwischen erfahrenen Berufstätigen und dem akademischen Nachwuchs ausbauen. Die Unterstützungsmöglichkeiten reichen vom persönlichen Mentoringgespräch bis hin zum finanziellen Investment in junge Gründungsteams und Ausgründungen aus der Universität Göttingen. Haben Sie Interesse oder Fragen? Through donations and personal commitment, alumni of the University of Göttingen enable us to support talented and committed students and implement numerous innovative projects. We would like to encourage you to participate in the development of our foundation university. With your help, we can strengthen the unique features of Göttingen as a location for science and scholarship. Get in touch with us about building profitable partnerships! Here you will find an overview of our current projects. Visionaries wanted! Become a member of the Förderkreis Forum Wissen and be at the forefront when a unique academic museum is created in Göttingen. Exclusive insights and a lively exchange are included.› More ? University Association Universitätsbund Göttingen e.V.